When it comes to email marketing, often the biggest challenge is simply building your email list. Many businesses wish their email database was larger. Others don’t have one at all and need to start from scratch. Regardless of where you’re at, it’s worth investing the time in creating a robust, targeted email list. Let’s admit it: we’ve all deleted marketing emails without even opening them. Regardless, email is still one of the most effective ways to communicate with your customers and prospects. In fact, 72% of consumers actually prefer for businesses to contact them via email. When done well, email is also one of the most cost-effective marketing channels out there. In a 2016 study by Econsultancy, 75% of companies reported that email offers “good” or “excellent” ROI. What does that mean in dollars? According to Campaign Monitor, email marketing returns $44 for every $1 spent. The trick is that effective email marketing requires a good email list. It’s great if you have a big email list, but if it doesn’t contain the right people, it’s not going to do you any good. Make sure you know who your target audience is, and try to understand who they are, and what they need. Creating buyer personas can help! People aren’t going to give you their email address unless you give them a good reason. Think of it like a trade. They are giving you their email address and trusting you enough to let you into their inbox. What are you giving them in return? Think about resources, offers, or incentives that would be valuable and motivating to your target audience. For professional email marketing, Gmail, Yahoo, and Outlook aren’t going to cut it. You need an email marketing program to help you create and send emails and manage your list – especially bounces and unsubscribes. You can use inexpensive tools like MailChimp or Constant Contact, or a more robust CRM system like Hubspot or Insightly if you need more features. 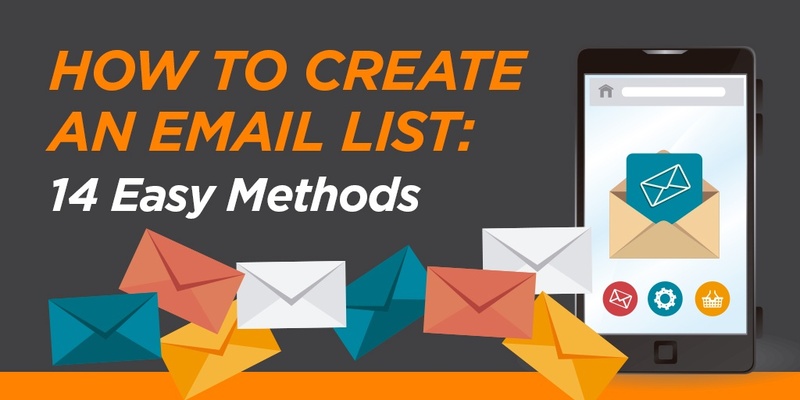 While you can build an email list without a website, it’s a lot harder. Since email is a form of digital communication, it’s easiest to collect that information digitally. Your website is the center of your online presence, so it’s the perfect place to gather email addresses. You don’t need anything complicated, but at a minimum, you need a website that proves you are a legitimate business and includes an opt-in email form. Buying an email list might seem like the easy way to get contacts fast, but we strongly advise against it. Even if the list company says that their contacts are accurate, well-vetted, and opted in, you’re still dealing with cold contacts who are not expecting to hear from you. It’s a low-quality list that is unlikely to generate high response rates and much more likely to annoy people. Furthermore, most reputable email providers have policies against using purchased email lists. If you try to do it anyway and the email addresses are bad or recipients mark the messages as SPAM, you’re likely to get in trouble with your provider and suffer from low deliverability. Purchasing lists may be annoying, but in most cases, it’s not technically illegal. However, there are certain rules you need to follow when sending out marketing messages, based on the CAN-SPAM Act of 2003. Most importantly, you need to make sure that you’re honoring unsubscribes and not continuing to email people who have opted out. Beyond that, make sure that you include contact information and unsubscribe options, and that you’re clearly and truthfully representing who you are and the subject line of your message. If you collect data from any European Union citizens, you also need to comply with the General Data Protection Regulation (GDPR) that went into effect on May 25, 2018. GDPR is much more rigorous than CAN-SPAM and sets a high standard for “freely given, specific, informed, and unambiguous” consent in order to send marketing messages. Even U.S. businesses who aren’t immediately affected would be wise to ensure they’re following best practices for email marketing and opt-ins. Your website is one of the best and easiest places to gather email information. If you have a blog or a newsletter, or you just send out company updates, include prominent calls to action (CTAs) on your website to ask visitors to sign up. Pop-up boxes are particularly popular for this. We may say they’re annoying, but they are effective. A study by Sumo reported that pop-ups converted at an average of 3.09% (which isn’t bad by itself), and top-performing pop-ups averaged a 9.28% conversion rate – which is excellent! You can set pop-ups to appear after a certain amount of time, at a certain point on the page, or when someone is about to exit the page. For a more polite option, you can have a box slide in from the side too. 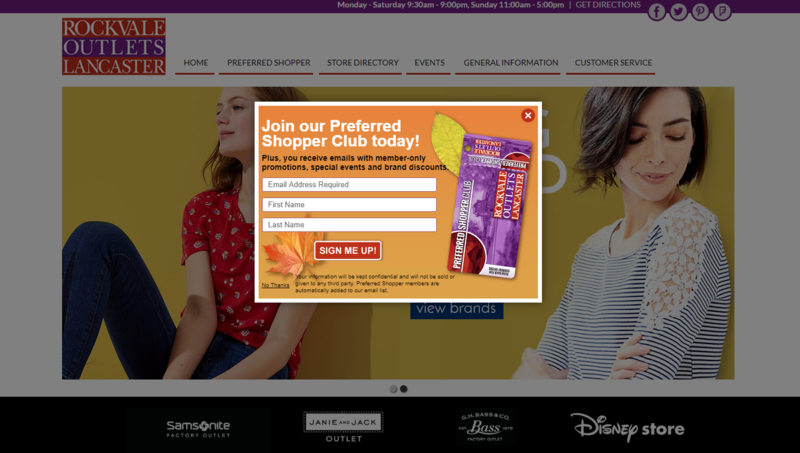 This pop-up from Rockvale Outlets grabs your attention and offers member-only discounts and specials to incentivize visitors to join. If you don’t like pop-ups, try including noticeable CTAs on a sidebar, or at the footer of your site (like the one below). Or, if you have a blog, you can include sign-ups alongside your articles to encourage users to subscribe for more content. Gated content is the stuff you only give away in exchange for personal information – things like e-books, templates, guides, or webinars. These resources have a high perceived value for your audience, so it’s worth it to exchange an email address to get them. Try including gated content offers within your normal, ungated content on a similar subject. For example, we recently wrote a blog post about building buyer personas. Within it, we have a call to action for a downloadable buyer persona template. This allows us to identify people who are more deeply interested in the topic and gather their contact information for further nurturing. If e-books and white papers aren’t your style, consider creating a free online tool or calculator. Just ask for an email address in order for the visitor to see the results. For example, Hubspot’s Website Grader offers a ton of useful information about your website and helps them capture tons of new email addresses. Quizzes are useful for much more than finding out what your spirit animal is or what Game of Thrones character you are. Create a quiz related to your business to add some fun and interactivity to your marketing while also gathering useful information about your prospects and customers (including their email address). Make the results shareable on social media to increase your reach build your list even faster. 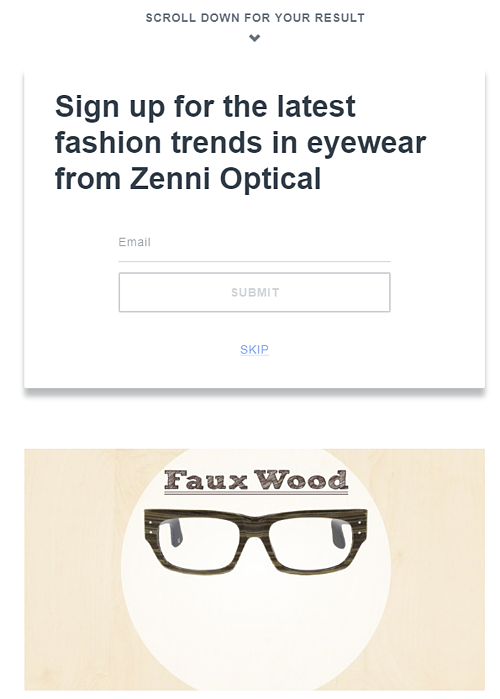 A quiz from Zenni Optical to find the perfect eyeglasses frames generated over 29,000 lead conversions (which translated into over $1 million in revenue). Not bad for one quiz. Who doesn’t like free stuff? A contest or a giveaway incentivizes people to provide you with their contact information. Again, social media is a great tool for sharing contests to even more people. One cautionary note: someone who gives you their email address for a chance to win something isn’t necessarily opting into marketing communications from you. You may want to re-confirm or double opt in any new contacts from a contest or giveaway. As we already mentioned, social media is great for promoting your content and getting more eyeballs on all your lead generation offers. Share links to your content on all of your social media pages, directing visitors back to optimized landing pages on your website. You can also include social sharing buttons across your website to make it easy for visitors to share your content themselves. Additionally, your Facebook Business Page includes a call to action button at the top. Customize this to direct your Facebook audience to lead generation pages and sign up forms on your website. Including social sharing buttons naturally makes it easier for people to share your content, but it doesn’t hurt to ask too. If you have great lead generation offer that’s sharable, ask your customers to share it on social media, or forward an email version to friends and colleagues. You can also create a refer-a-friend program where you incentivize your existing subscribes to invite their friends to participate too. Just be cautious that you’re getting permission from the referred friends before you start emailing them a bunch of your marketing materials. Not only is guest blogging great for SEO and earning backlinks to your website, it’s helpful for building your email list too! When you contribute to other websites, make sure you have a strong author bio attached the article. Within your bio, you can include links back to a blog signup page or content offer landing page on your website. Think about business groups, trade organizations, or complementary but non-competing businesses in your industry – anyone who is targeting a similar audience. You can promote each other on your websites or email newsletters, so each of you gains some exposure to the other’s audience. For a deeper collaboration, consider co-hosting a webinar, writing an e-book, or partnering together on original research. While there are plenty of ways to capture emails digitally, old-fashioned offline methods work as well. If you’re a retailer or a restaurant, especially, you could have an in-store sign-up sheet in your checkout area. Many stores also offer rewards programs, birthday clubs, or even simply digital receipts. Have your staff ask customers during checkout if they’d like to provide an email address to sign up. From business meetups to conferences to trade shows, in-person events are a great way to meet new prospects for your email list. Collect business cards from people you talk to, and follow-up to ask if you can include them on your email list. You can also host events like lunch & learns, seminars, book clubs, community events, and more. Just ask people to RSVP online with an email address. Traditional marketing might not seem like the most obvious way to gather digital information, but it can still be effective. 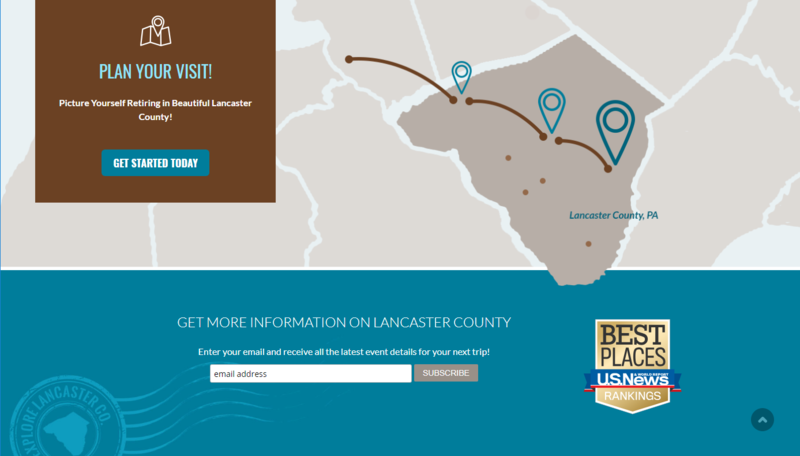 Include shortened links, personalized URLs, or QR codes on print ads and direct mail. These should direct visitors to an optimized landing page with a compelling call to action to capture their contact information. If you have an online business, you probably have email addresses for most of your paying customers. However, transactional emails like welcome messages, order confirmations, shipping notifications, etc. are a great way to reconfirm information and opt-in your customers specifically to marketing communications. Meanwhile, if your customers buy from you offline, you may have a harder time capturing their email addresses. Still, transactional materials like product packaging, price tags, invoices, or receipts are great places to include CTAs for opt-in offers. While some of these tactics for growing your list are faster than others, remember than any good email list takes time. When it comes to email marketing, quality trumps quantity. An accurate list of opted in, highly engaged contacts is one of your business’s most valuable assets, and it will pay dividends versus a large, cold list any day. Struggling with email marketing for your business? We also offer email marketing services which can help make your life easier so you can worry about other business needs while we nurture your customer relationships for you. If you found this article helpful, don’t forget to share it on social media, or forward it to a colleague.